Ibrox Noise: Has Steven Gerrard made a mistake with striker? Has Steven Gerrard made a mistake with striker? With Jason Cummings’ loan switch from Nottingham Forest to League One Peterborough confirmed, Alfredo Morelos’ latest poor display on Friday night does make us wonder exactly where our striking options are and why we didn’t elect to try and clinch the Cummings deal. We admit it – young Jason struggles up front on his own – he doesn’t have the physique to hold play up and bring others into it, nor does he dominate aerially – we long accepted that when we signed him, and couldn’t fathom why our ex manager wouldn’t play him, or to his strengths. Except twice – twice our lad was in a two up front, and guess what – scored four times. But, que sera, he has gone to Peterborough and is said to be absolutely devastated he didn’t get the move to Ibrox. And Alfredo Morelos’ latest display of selfishness, profligacy, pettiness, ill-discipline and pure frustration makes us wonder just what the path forward is up front. So assessing our striker options we currently have a sub-par Colombian (whose fanboy supporters have finally started to pipe down), a promising but raw youth prospect in Zak Rudden who didn’t make the bench v Shkupi, and a new signing we can’t even judge yet in Umar Sadiq. It’s not inspiring whatever your stance is and we can’t help wondering if Cummings shouldn’t have either had his loan extended so Stevie could judge him fully, or be signed permanently. Being more general, I know I know, Let It Gel Give It Time and all that, and we will, but many of our readers mistake criticism for non support. Only recently we were amused that our articles of late drew so much ire and had us castigated as Celtic fans. This following two months of nothing but rampant positivity on site following the pre-season build up. The moment you criticise what deserves to be criticised, some leap on you and you’re a Celtic fan. If we were Celtic fans we’d be enjoying the stuttering start our team made on Friday, and would be slagging off everyone. Don’t mistake heartfelt criticism for revelling – we want our team to be better, and we want to feel like this is Rangers again, but it just isn’t right now – not till Stevie figures it out, if he can. Folk say the negativity is unreal, and we’ve overreacted to one single match. Well, the problem is history – Pedro, Warburton, Murty, McCoist – we’ve seen this exact rubbish before and we know a t*rd when we see it – and we see the same supporters divided down the middle AGAIN, between those who want to give it time and the brave ones willing to call a spade a spade. And just ‘hope’ it turns round again. It even worried us to see Gerrard bemoan missed chances – the moment we start to do that is the moment we’re justifying poor performances. Should Shkupi bemoan their hitting the bar? How different the night could have been had that gone in? Or being penalised when it wasn’t a penalty. Goes both ways if you want to play that game. Until this team wins wins wins and occasionally has a bump like all great teams and sure as heck doesn’t struggle in the UEL qualifying rounds season after season to backwater European mobs, this isn’t where we should be. In truth, other than a few nuggets of positivity, nothing on Friday felt like Rangers. If that makes us ‘Celtic fans’, we’ll just have to take it. We’re big enough and ugly enough to handle the smears. We want to look utterly stupid on Tuesday night. We want Gerrard to send our lads out, destroy this mob and make us look very silly. Nothing would please us more. with peterborough utd!I wish him all the luck and best wishes in the world.Hopefully one day,jason cummings comes back to rangers and goes on to prove,that we should never have allowed him to slip through our fingers,in the first place!Truly think fellow besrs,that we've made a mistake here.I know a lot of our supporters,think the same thing, regarding jason cummings.He was NEVER given a proper chance at rangers and nobody can say otherwise. You really are setting yourselves up IN. Pointing out weaknesses is all well and good but you ha e gone in all guns blazing way too early. I don't think that SG will be the Messiah, but you have to give the guy a chance. Cummings is gash. He has only proven himself capable in two seasons at Hibs in the 2nd tier of Scottish football. There will be 10-20 better strikers available in the coming weeks. Aye, he was always gash when he played against us, right enough! The less he plays the greater he gets. I agree that the performance on Thursday wasn't what we hoped for but you really need to take a long hard look at yourself and you don't need to wait until Tuesday to make yourself look stupid. After one game in charge you've already lumped Gerrard in with Pedro, Warburton, Murty and McCoist, are you really serious. Your not a Celtic fan, your just being ridiculously negative and irrational in your judgement of Gerrard. We didn't play well but we won and are in a good position to go through to the next round, and by the way Scotland happens to now be part of the "backwater European mob". You don't need to make daft judgements after 1 game. It makes the site look bad. And by the way much as I wanted Cummings to succeed I think League One in England is just about right for him. He's not Rangers quality at this point in time and is unlikely to ever be. If desperately wanting to play for Rangers was important then I would be a club legend by now. Unfortunately cumdog is no where near good enough. No think it is... he is exactly what we need played in a 2 to win this league . I like Cummings and we could have got him for 500,000 he knows how to score in Scottish Football . Guys anyone calling you Celtic supporters are deluded. Criticism of our team is wholly acceptable however the last couple of posts have been very negative. When you look at the bare bones of it we have played 2 games at Ibrox won 2 and conceded none. I like many of you know all too well the disappointment of the last few seasons but we need to understand we are dealing with a very different beast with Stevie G. Yes he has no managerial experience but this guy has captained club and country for year. He has played against and beaten the best. He is not a bang average player like Murty. I never believed for one second in the Pedro experiment. Even alves to me was a risky buy but I does appear on the face of it that you guys at Ibrox noise bought into the Pedro regime more than what Stevie is trying to accomplish. Maybe because Pedro caused such chaos your not willing to believe we could have something special on the cards. He has brought in fresh blood not old tired hasbeens who want an easy payday. As for the Morelos and Windass arguments. Yep I totally agree how frustrating they can be. But for those with short memories they played a massive part in rangers being the most successful attacking team in the spl last season. It was defensively where we lacked and we have looked far superior in defence this year than last. I guess what I am saying guys is let’s not get on the teams back... especially when we are winning. 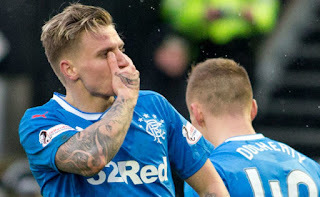 WE should have signed Jason Cummings on permanent deal for a year,Alfredo Morelus is our lead striker right now but he struggles with his finishing way to often..i think tactically we did not get it right for jason...doesnt matter who you are,you need a very close attacking partner....this is also where Morelus struggles right now..
a striker.morelos wants to go?if he does he should go. he blew it against the jealous greeners. If we want to close the gap on Celtic then Cummings is not the quality required - end of! Mistake made by not Bringing Cummings Back! 4. Hes 22! He would have Matured into a 20+ Goals a Season man for us! And that would be one amazing partnership because they are both Bluenoses and they are Best Pals and Both know where the Goal Is! I think Cummings would've been a decent back up striker for £500k but he is now history and will never play for us again. If he's a success at Peterborough his price will go up. If he's a failure would Rangers want to sign a Peterborough failure. Teenage fan boys have it much easier than us. Apart from puberty. Well said Gav! Someone talking sense at last. You can't just wish it better and make it happen. It takes time to build a team and it's a process that should've started with McCoist. If we had accepted then that we weren't going to win anything for 5 -6 years (and we haven't) we would be in a much better place. We are undoubtably getting better year on year despite the disasters of previous managers so let's hope that Stevie G is finally the man to pull it all together and build something for the future not for now. The early signs are promising with the quality and age of the signings. Not necessarily what we need long term but moving gradually in the right direction. When are people going to get the fact that Morelos is just not, up to the job? I was amazed SG kept him on, tbh.